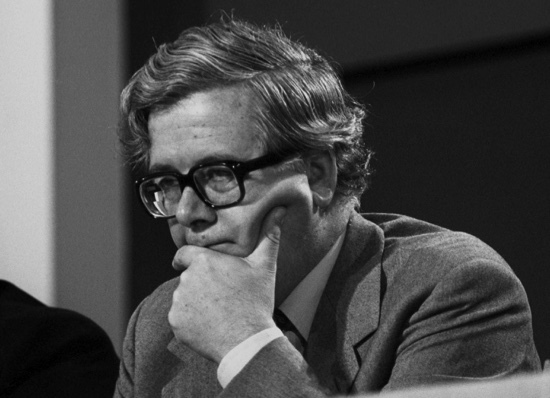 It was fitting, perhaps, that Geoffrey Howe, the Tory statesman, died the same weekend that prime minister David Cameron listed his four demands for reforming the European Union — a prelude to the expected 2017 referendum on British EU membership. Howe died at age 88 after a heart attack on Saturday, ending one of the most accomplished lives of postwar British politics. Entering the House of Commons for the first time in 1964, Howe served as a trade minister under Conservative prime minister Edward Heath. But it was during Margaret Thatcher’s reign that put him in a real position to shine — first as chancellor between 1979 and 1983, during some of the headiest days of the Thatcherite free-market revolution, and later as foreign secretary from 1983 to 1989, when he tackled the US invasion of Grenada, the denouement of the Cold War, the Libyan crisis and, of course, an increasingly adversarial relationship between Thatcher and the European Economic Community. It was Howe’s resignation speech in 1990 as deputy prime minister, having been unceremoniously demoted by Thatcher from the foreign office, that led to her own downfall just 12 days later. The speech today is worth watching, not for its drama (though it contained that in spades — Howe’s quiet and gentlemanly manner couldn’t have been more devastating in its effect) but for its warning on Europe, especially with the 2017 referendum looming. The pity is that the [Harold] Macmillan view had not been perceived more clearly a decade before in the 1950s. It would have spared us so many of the struggles of the last 20 years had we been in the Community from the outset; had we been ready, in the much too simple phrase, to “surrender some sovereignty” at a much earlier stage, if we had been in from the start, as almost everybody now acknowledges, we should have had more, not less, influence over the Europe in which we live today. We should never forget the lesson of that isolation, of being on the outside looking in, for the conduct of today’s affairs. We have done best when we have seen the Community not as a static entity to be resisted and contained, but as an active process which we can shape, often decisively, provided that we allow ourselves to be fully engaged in it, with confidence, with enthusiasm and in good faith. We must at all costs avoid presenting ourselves yet again with an over-simplified choice, a false antithesis, a bogus dilemma, between one alternative, starkly labelled “co-operation between independent sovereign states” and a second, equally crudely labelled alternative, “centralized, federal super-state”, as if there were no middle way in between. What kind of vision is that for our business people, who trade there each day? For our financiers, who seek to make London the money capital of Europe? Or for all the young people of today?…. These concerns are especially important as we approach the crucial topic of Economic and Monetary Union. We must be positively and centrally involved in this debate and not fearfully and negatively detached. The costs of disengagement here could be very serious indeed. There is talk, of course, of a single currency for Europe. I agree that there are many difficulties about the concept – both economic and political. Of course, as I said in my letter of resignation, none of us wants the imposition of a single currency. But that is not the real risk. The 11 others cannot impose their solution on the 12th country against its will, but they can go ahead without us. The risk is not imposition but isolation. The real threat is that of leaving ourselves with no say in the monetary arrangements that the rest of Europe chooses for itself, with Britain once again scrambling to join the club later, after the rules have been set and after the power has been distributed by others to our disadvantage. That would be the worst possible outcome. As it turned out, the history of British participation in European monetary union was not particularly happy. The ‘Black Wednesday’ crash just two years later resulted directly from British attempts to maintain its place within the European currency snake. Later, it would be Labour chancellor Gordon Brown whose ‘five tests’ would definitively put an end to the notion that the euro would replace the British pound anytime soon. Looking back, given the eurozone crises of the last half-decade, many Britons believe, with good reason, that they escaped a monetary straitjacket. But imagine if Thatcher had taken Howe’s advice, and the Tories had engaged in good-faith negotiations with the Germans and the French in the leadup to the Treaty of Maastricht. There’s a good chance that the resulting single currency would have been a more truly international project — that the resulting European Central Bank would not look like a continental version of the Bundesbank, and that the euro itself would not resemble a supersized Deutsche mark. Forcing greater skepticism and deliberation into the monetary union project might have highlighted some of the defects that became all too apparent in the eurozone’s structure with the debt crisis of 2009-2010, the aftershocks of which have done so much damage, through economic misery and unemployment, to the political designs of an ever closer Europe. Despite all of that, Howe’s words ring even truer as Cameron prepares to negotiate what he hopes will be significant concessions for a multiple-speed Europe, with the British in the skeptically slower lane. Nevertheless, there’s no guarantee that Cameron, even if he has real progress to show for his EU renegotiation efforts, can command the political victory against ‘Brexit’ in the proposed 2017 referendum. The late Denis Healey, a Labour statesman who preceded Howe in death by merely a week, once declared that being attacked by Howe was akin to ‘being savaged by a dead sheep.’ Cameron, who is no stranger to barnyard attacks, certainly knows how close he came to what would have been a disastrous (for unionists, at least) Scottish vote for independence in 2014. The forces of populism and rupture, when harnessed by able political figures, are difficult to tamp down. That will be especially true in the 2017 Brexit referendum. Nigel Farage, the leader of the United Kingdom Independence Party, may not have succeeded in breaking through in the May 2015 general election, but UKIP still won 12.7% of the vote, and Farage is at his best when he’s reducing the European question down to the ‘false antithesis’ of which Howe so articulately warned. Labour’s new leader, Jeremy Corbyn, has given only the most tepid of endorsements for the ‘in’ campaign, despite appointing a committed europhile in Hilary Benn as his party’s new shadow foreign secretary. Some of the party’s top donors are already bankrolling the ‘out’ campaign against a European superstate that has become synonymous with austerity and center-right budget cuts. Meanwhile, Scotland’s first minister Nicola Sturgeon will, at face value, support the ‘in’ campaign, but she knows only too well that the European Union’s popularity in Scotland is such that a majority British vote to leave it would give her and the Scottish National Party a bona fide reason to call for a fresh vote on independence. In light of her long-term goals of an independent and Nordic-style Scotland within the European Union, a vote for Brexit would suit her just fine. There have always been a handful of lonely europhile Tories — Kenneth Clarke, Michael Heseltine, Chris Patten, Edward Heath and others. Cameron, one suspects, is more among their rank than he’s let on. His one-time coalition partners, the Liberal Democrats, are consistent in their support for Europe, too. Howe’s speech — and his career bridging the ‘wets’ and the ‘drys’ of the 1980s-era Tories — provides a roadmap for Cameron in the difficult months ahead. It’s still a better deal for the British to remain a part of Europe than to leave it, for all of the headaches a messy divorce would cause. The threat that Britain could leave the all-important single market, with all of the reliability, rule of law, free-trade agreements and other concessions accumulated over the past four decades, would be massively destabilizing to the British economy — so much so that it could threaten London’s status as the de facto financial capital of Europe. Given the current level of integration, a Brexit could also leave the United Kingdom outside the single market altogether. More likely,, as Howe warns, it would come crawling back — subject entirely to the whims of the rest EU’s member-states and to the writ of Brussels, despite lacking the power to influence Europe’s future direction. In other words, Brexit might actually result in an even more undemocratic result for the British electorate.